4 Bedroom Detached House For Sale in Sheffield for Guide Price £375,000. Only upon internal inspection can this deceptively spacious four bedroom detached family home be fully appreciated. The property has been significantly extended to the ground floor and boasts 6 reception rooms. Generous front enclosed parking area and detached garage and large storage garage. We strongly recommend an early viewing. 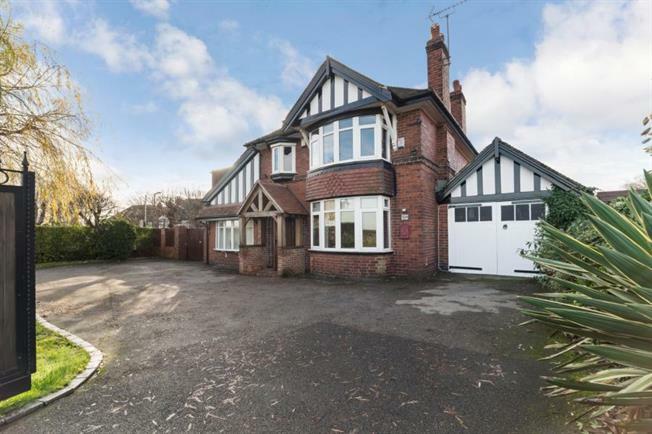 To the ground floor the entrance porch leads to the inner hallway and cloakroom/ W.C, Formal living room with feature fireplace, Dining room, superb modern fitted Kitchen open plan through to the Conservatory and further Living room. French doors lead to the second Conservatory leading to the family room/Games room, Utility room and integral Garage. To the first floor is the Master bedroom with en-suite shower room, Three further bedrooms and the family bathroom. Offering a superb front aspect over open fields, this property has a gated driveway providing off street parking for multiple vehicles, access to the single garage and further timber storage garage. To the rear is an enclosed garden with patio area, the rest is laid to lawn. South East Sheffield is popular with buyers and tenants of all ages, boasting excellent local schools and amenities. The area is located between Junction 30 and 31 of the M1 Motorway network with further access to the M18 and A1. Sheffield Supertram runs through the area and offers fantastic links to Sheffield City center, Sheffield Train Station and across to the North of the City, Sheffield Arena and Meadowhall. Crystal Peaks Shopping Center and Drake house Retail Park offer excellent local shops and amenities, while Sheffield City Center and Meadowhall are also just a short drive away via the Mosborough Bi-pass. The area hosts a large number of local eateries and 'Gastro' style pubs and restaurants. Mosborough Hall and Aston Hall are popular local hotels standing in beautiful grounds and Renishaw Hall and gardens are wonderful to visit and offer local year round events.